Obasanjo, Makarfi meets in Ogun state – Royal Times of Nigeria. 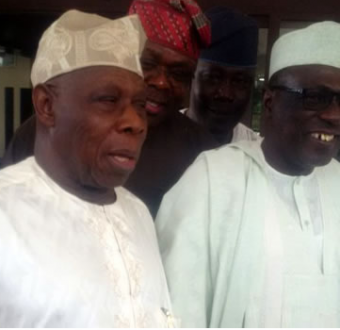 The National Caretaker Chairman of the Peoples Democratic Party (PDP), Ahmed Makarfi, visited former President Olusegun Obasanjo, in Abeokuta. Markafi, who was accompanied by PDP leaders, including Sarafa Isola, a former minister, were received by Obasanjo at the Green Legacy Hotels and Suites located in Olusegun Obasanjo Presidential Library, Abeokuta. The meeting, Daily Sun gathered, was earlier scheduled to take place at the Hilltop Residence of Obasanjo, but was later shifted to the hotel. After the closed-door meeting between the former president and Makarfi, those who accompanied Markafi were invited into another meeting at the grill house section of the hotel that lasted for about 25 minutes.